Imagine you decide to expand your home basement and during the process of knocking down a wall you unearth a long-forgotten chamber. That’s exactly what happened in 1963, when a Turkish man began demolition. To the man’s surprise, the hidden room led to a massive 18-story underground city (1). The discovery of the ancient city of Derinkuyu buried nearly 200 feet deep revealed a network of tunnels, steps and rooms. It’s estimated that the city was capable of housing 20,000 people. The amazing city contains a network of “kitchens, stables, churches, tombs, wells, communal rooms and schools.” The masterminds behind the creation of this underground city is unclear since it’s impossible to carbon date the carved-out city (2). One insight to when it might have been used last came as the result of the “Greek inscriptions” that were clearly “added to the ancient city” and cave-like chapels used for churches. Based on these markings and some artifacts, experts surmise the city was used during the Byzantine era in 780-1180AD. Archeologists speculate that the city was used during the Arab–Byzantine wars as a safe haven for the residents living above ground. The Cappadocia region has long been a World Heritage site. Known for its unique rock formations fairy chimneys, these volcanic formed conical spires were carved into dwellings. 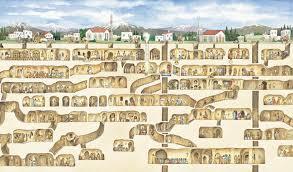 Derinkuyu, like smaller underground cities in the vicinity is carved out of tuff. This is a type of rock that is composed of hardened volcanic ash. Tuff is a porous, malleable and light rock, making it easier to carve out an underground city than other forms of rock. Some of the features found in this underground city include a massive ventilation system that delivers air all the way to the very bottom chambers. Huge round stone doors that can only be closed from the inside can seal off the city. Each round door has a small round hole in the center. Some speculate this was a peep hole or used to shoot arrows at attackers (3). Each story features these heavy inside-only-controlled doors and can seal itself off from the rest of the city. Nearly 600 entrances afforded topside dwellers access into the underground city. One unique feature in the city is a “barrel vaulted ceiling” with a series of room formed along the left side. Archeologists believe this was at one time used as a religious school (4). Water channels and air shafts delivered these vital elements to the entire underground city. The temperature of the city is a consistent 55° Fahrenheit. The climate of the underground city was ideal for storing produce and it’s speculated that the network was often used to store grains and perishables. According to History.com, the region where Derinkuyu is located, Cappadocia, holds a mysterious underground network of 200 similar cities, most much smaller than Derinkuyu. Many of the smaller cities feature two or three stories only. 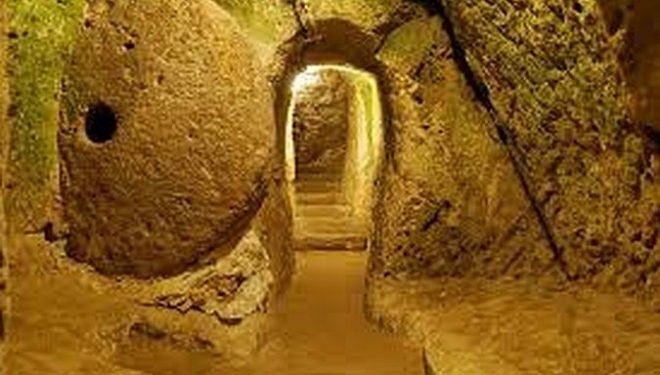 These underground cities are interconnected through an underground tunnel network that is several miles in length. Notably, Derinkuyu is connected to several underground cities in the nearby Nevşehir Province. This connecting tunnel is an amazing five miles long. In 2015, National Geographic featured the discovery of what’s known as the underground city of Cappadocia. Like Derinkuyu, it features an entire self-sustaining system for a large population. It’s estimated that once fully excavated the city will surpass Derinkuyu in size (5). The city is over 371 miles deep and considered to be about one-third larger than Derinkuyu.